John Hillcoat directs and I don’t really know enough to pass judgement. Formerly a music video director, having directed – amongst others – videos by Nick Cave and the Bad Seeds, Manic Street Preachers and Depeche Mode. He then progressed to features, only really hitting the big-time after directing The Proposition in 2005. This was the predescessor to The Road. Now, John Hillcoat is credited with four films ‘in development’ on IMDB. He is a hot ticket – and should be – because The Road is a masterpiece. We are situated in the not too distant future – following a huge natural disaster that is only hinted at. Something to witht he sun I would assume. This context, whatever the case, is post-apocolypse. We are told about the fears – cannibals because people are starvng and that is how people are staying alive. Due to this, tribes and gangs stalk the land, hoping to find the people they can eat to stay alive. Having had this explained in voice-over, Man and boy are forced to hide when one tribe appear with a clear intent to eat. We see the confrontation and see how dangerous the environment is. We also see how, one night, the Father and Son are awoken by a fire on the horizon. This world is terrifying. This is a world that is Hell on Earth. All we need to know is that Man and Boy hope to navigate their way South. To the Ocean. 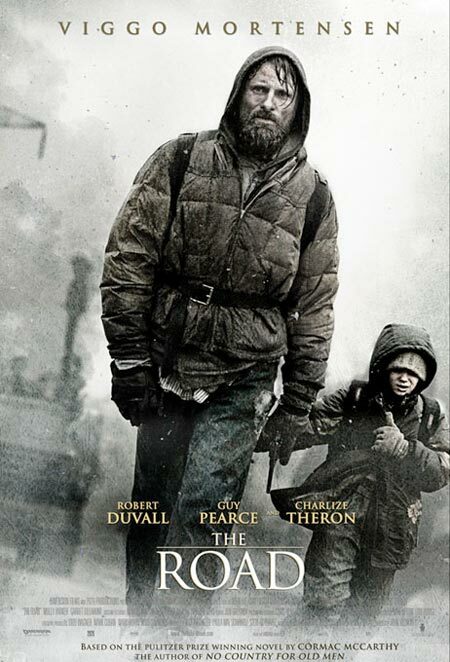 En-route, Man and Boy meet a range of different characters – an Old Man played by Robert Duvall, a ‘Theif’ played by Michael Kenneth-Williams (aka, Omar Little from The Wire) and then, in the final act, Guy Pearce and Co. The Father asks the people he meets whether ‘they are the ones following them’ and, each one responds that they are not. A Visual Challenge – How can you adapt McCarthy’s The Road? I have been reliably informed that the book never shows anything too explicit and the film is similar in tone. First off, its a 15 that feels like it should be rated 18. I was petrified the entire way through and when i think back to the rating I realise how low the rating is – some Saw movies are, though grotesque, are not truly scary. This is. this horror before in our history classes and on the news. I am positive of the many layers that there surely is within this film and it is this we are forced to consider. I would assume this ambiguity of time and place in McCarthys book is replicated by Hillcoat – the time is not important as the names of the two characters wandering ‘the road’ are not important – Man, Boy, Thief – they are all representations of deeper meanings. We need to view this film as an allegory of an outlook on monotonous life – when all is taken away, what do we have left? This desolate landscape is all we see and, through this, we manage to see the parrallels and conflicts in the story that reflect our own lives. I am sure that there is a wide range of interpretations of The Road and inevitably – some may be much more intelligent than my initial understanding of the film. [Spoiler alert] There are certain shots that also add to these meanings. I’ve discussed the idea of ‘the road’ being a physical representation of life – and how Man and Boy walk through life with different goals. Man living to die – aware of his inevitable demise but pushing through it for the sake of others, while Boy is living to live – his life has to be long and prolonged. It is he who Man lives for. The idea that people follow both people may be an attempt to explain how we all influence each other and that – as possible followers – we need to be influenced by those who strive to live life to the full – like the Boy. 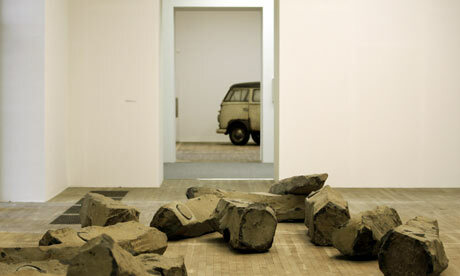 The whole costuming of the characters, I felt remided me of the dirty greens and browns that cover the work of Joseph Beuys. The textured fabrics and the rusty and decaying trolleys and machines simply play on the mind with a sense of dirt and uncleanliness. If you see the image chosen, even the use of a child as the centrepiece to the topics explored also are comparable. Secondly, and this may be a loose link, I considered the romanticism of Caspar David Friedrich – the greys and brown colours within a rural landscape. 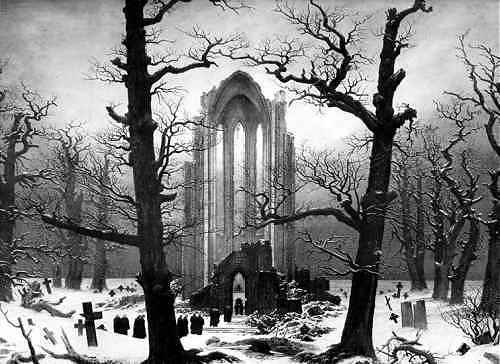 The empty buildings created an almost gothic landscape – recalling the Gothic landscapes of Friedrich. Its interesting, because his landscapes rarely had people in them – just vast, empty – almost mythic worlds – presented to us. You could even argue that it presented worlds without human interferance, akin to the post-apocalyptic world we see. The one thing I am being cautious not to mention is I Am Legend and, other than the entire thematic ideals The Road explores, the idea of the last man on earth is similar. Also, the dusty, yellow-ish look is vaguely comparable but, other than that, there is nothing. Not really – Will Smith is completely alone, with a dog. Viggo is, with child, and is primarily looking after the child – not himself, while Smith thinks of himself as numero uno. So no need to compare them … there are better comparisons I imagine. One I would like to consider is Lars Von Triers Antichrist. Both are rooted in historically artistic tones – with an almost Gothic look. Both have a certain rural, primative quality – focussing on the primitive features of humans and, more importantly, how you might deal with things when on your own. Antichrist has nameless characters – as does The Road and the huge themes of life and death – in their unique way – is explored in both films. I have only seen each of them once so I would hope the comparisons only grow when watching them together but, chances are, I won’t watch Antichrist again.